$135 for the set. 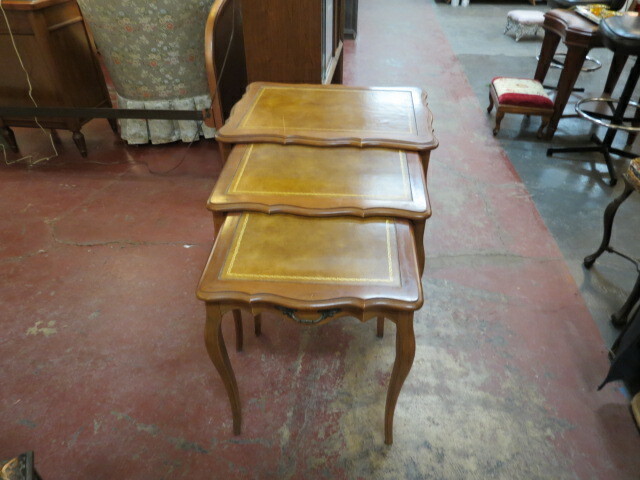 Vintage antique set of walnut leather top nesting tables, c. 1960. Nice set. Use as a side table and then have 3 tables when company comes. Curved top and legs. Brown leather top with gold embossed border. Perfect for your living room. Very good condition. Smallest measures 17.5in wide, 16in deep, 21in tall; medium sized measures 20.5in wide, 17in deep, 22in tall; largest measures 25in wide, 18.5in deep, 23in tall.